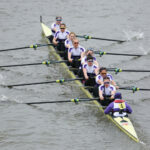 The University of London took Gold in Women’s Championship Eights to be crowned British University Champions, with the UL Men taking the Silver in Men’s Champ Eights. Targeting the Eights events, UL came away with one Gold and three Silvers across the four Eights events. 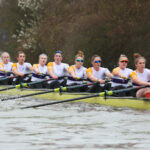 In Women’s Championship Eights the University of London took the lead early in the race and then moved away to take victory ahead of Oxford Brookes, and become the first UL Women’s Eight to ever win Champ Eights. There were Silvers for both the UL Men’s 2nd Eight and UL Women’s 2nd Eight. In the final of Championship Men’s Eights it was a showdown between UL and Oxford Brookes, with Brookes taking the win by a length. UL backed up the eights performances with Gold in both Men’s & Women’s Championship Coxless Fours. Once again to have both Men and Women performing at such a high level is incredibly strong. The UL Men also took Silver in Championship Coxed Fours. And the UL Women won Gold in Intermediate Coxed Fours and Bronze in both Champ and Intermediate Pairs. The UL Women matched their sweep performances in sculling, taking Gold in Championship Women’s Doubles, Gold in Intermediate Quads and Silver in Championship Women’s Quads. The University of London returns to racing at the end of May at the Metropolitan Regatta.